Celebrate your little one’s first birthday in style with these charming paper cups, part of a full line of children’s party ware. Featuring a unique design in a pink and white palette, these cups have been specifically designed with little girls in mind, and provide a practical but pretty way to enjoy your celebration drinks. 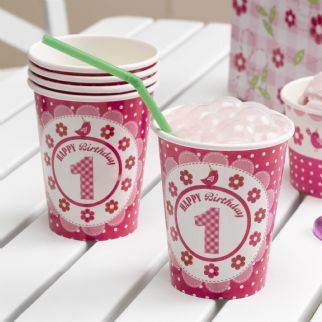 Cups have the number 1 and ‘Happy Birthday’ text on the front, accompanied by a whimsical flower and polka-dot design.